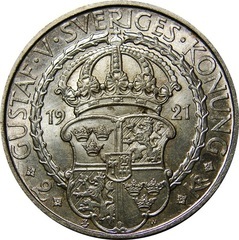 The 2 Kronor was minted in 1921 to commemorate the 400th Anniversary of the War of Liberation. The war started in January 1521 when Gustav Vasas led a small army and sacked the the city of Västerås in an effort to depose Danish King Christian II from ruling over Swedish provinces. The war ran from 1521 to 1523 with Gustav being victorious and liberating Sweden from the Danes. At the end of the war in 1523 Gustav would become the ruling monarch (Gustav I) and successfully united the provinces of Sweden and established a strong central government. Gustav's success as both a liberator and ruler has labeled him as the founder of modern Sweden and father of the nation. Designed by Eric Lindberg the obverse design features a bust image of Gustav I facing right. 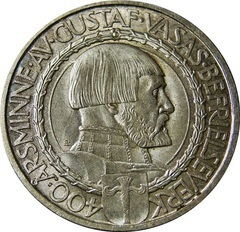 On the outer periphery (in Swedish) is the phrase “400 ARSMINNE AV GUSTAF VASAS BEFRIELSEVERK” or “400 YEARS REMEMBRANCE OF GUSTAV VASAS LIBERATION”. Located just above the shoulder (near the base of the neck) are the designer's initials “EL”. Designed by Karl-August Wallroth, the reverse design features the Swedish coat of arms. On the outer periphery is the phrase “GUSTAF V SVERIGES KONUNG” or “GUSTAV V SWEDEN KING”. On the lower outer periphery is the denomination “2 KR” and just below the coat of arms design is the designer's initial “W”. With a small mintage of only 265,943 coins one would expect these to be expensive but to the contrary they are affordable. Remarkably, many coins were saved in high grades and survived through World War II.